We'd love to chat with you. We're always here to listen to anything you'd like to talk about. Even weird stuff. Media Inquiries- While we're happy to answer any and all questions, we typically don't chase lists, headlines, or reality shows. We mostly like to cook food for people and bring it to them. Charitable Contributions- We spend a significant amount of time and money helping out friends who need a hand, but get literally dozens of requests every week. Unfortunately we can't afford to help everyone, but we try to do as much as we can. 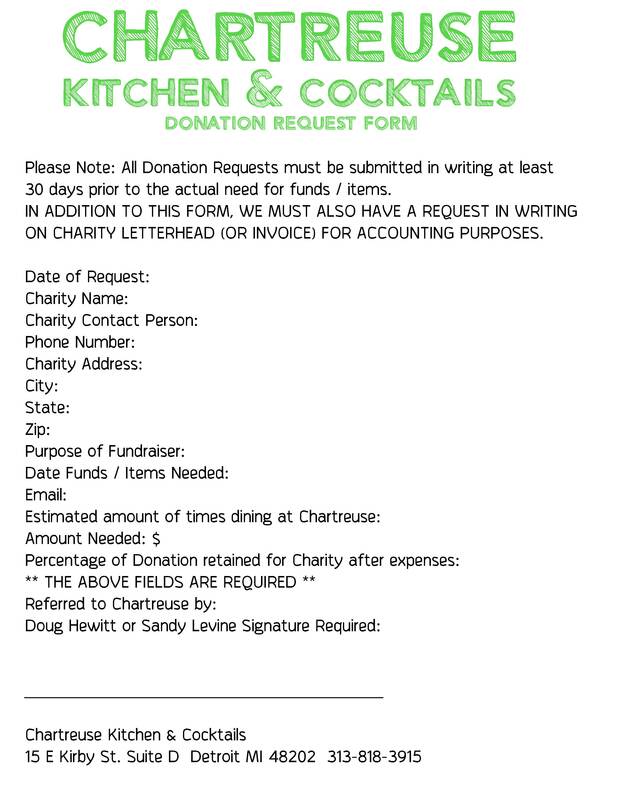 If you'd like us to review your cause, please fill out this form and email it to info@chartreusekc.com. Employment- We are always looking for driven, friendly, and hospitable people who like to hustle and enjoy being around all types of people. Chartreuse is by no means an easy place to work, but we've been told many times that it's a good place to work. We have very limited turnover and are pretty picky about who joins our team. If you think you'd be a good fit, please send us a resume. Compliments- These never get old. Our staff works, really, really hard and it means a lot when that effort is recognized by our guests. It makes us love our jobs even more. Complaints- We are always working to get better, but we are humans, and we have bad days, make mistakes, and fall short. Please let us know how we can do better if we didn't live up to your expectations. We’re on the corner of Woodward & Kirby in beautiful Midtown Detroit. The Park Shelton parking structure (attached to our building) is available for $5 for 2 hours and 2.50 for each additional hour. Street parking is available on Kirby Street, Woodward, or Ferry Street- be sure to pay at the pay station. We look forward to seeing you soon! Call us at 313-818-3915 to speak with someone about your party’s needs or click below to make a reservation.